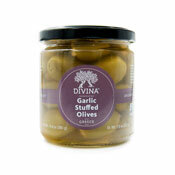 The most flavorful Bloody Mary mix! WOW! Best bloody mary mix ever. 've had other mixes that leave behind lots of pepper and celery seed at the bottom of the glass- not here - just great flavor! 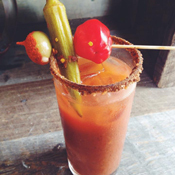 A Bloody Mary with a Southern twist. 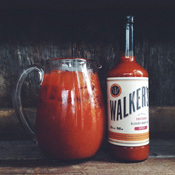 Harvesting the regional flavors of the South, Walker's Southern Bloody Mary Mix takes a fresh, savory approach to the classic cocktail. It starts with tomatoes and fresh squeezed lime juice, and hits the next level with bourbon barrel aged worcestershire, blackstrap molasses and creole mustard. Did anyone say spicy? Bloody Mary's have always been a passion for Kristin Walker. 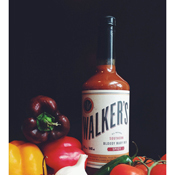 A high-end restaurant veteran, Walker, owner of Nashville's Walker Feed Company, saw a need for an all-natural, premium Bloody Mary mix for upscale bars and restaurants. Bartenders had an issue of having to make it before the weekend and maybe they would run out. She wanted something straight out of a bottle that was not only good for you, but tasted good as well. Walker was no stranger to Bloody Mary's. She used to carry bags of spices and accoutrements to friends homes where she would whip up her own batch of the piquant cocktail. That hobby soon turned in to a full time business.